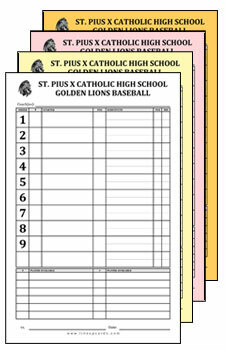 If you have a special request for your lineup card or dugout card, tell us! We are happy to customize printing based on your needs. Please ask if you do not see something you are looking for. We can design and print whatever line-up card you are looking for. Send us an email to service@lineupcards.com and we will give you a quote. Please be sure to include your logo (EPS, PSD, AI, PDF, JPG, or GIF). If you would like to call us, please dial (678) 336-5277. If you receive voice mail, please leave a message. The message will say Kapp Koncepts because lineupCARDS.com is a division of Kapp Koncepts, Inc. If you intend to use a Purchase Order with your order (P.O. ), then please email (service@lineupcards.com) or fax (678-998-5277) a copy.